This building has been the best selling model over the last several years and had no problem holding onto 1st place. This building, especially when optional windows are added, is perfect for storage of everything from a mower, to garden supplies, to Christmas decorations and everything else in between. While we sell lots of pressure treated buildings, our customers seem to love the ability to be able to customize their side lofted barn colors to their own choosing. As far as size is concerned on the side lofted barn, the top selling storage shed is either a 10′ x 20′ or a 10′ x 16′. The lofted barn has long been a popular storage option for all sorts of uses. Oddly enough, the side lofted barn is basically a lofted barn with the doors moved to the side. Lofted barns come with 6′ 3″ sidewalls and overhead lofting space that is fantastic for storing away stuff. Lofted barns come with as much or as little lofted storage as customers want. Some customers choose to have as much lofted area as possible while others prefer no lofting and plenty of head room. Many customers will also add an options like windows and shelving. 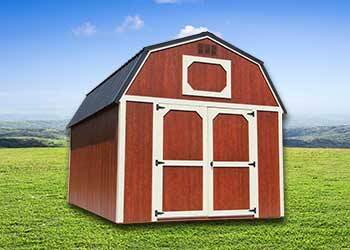 Rounding out our top selling storage sheds of 2017 is the utility shed. 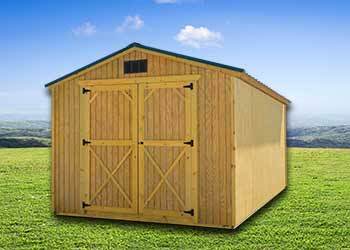 The utility shed is the most basic storage shed we sell. The most popular option we sell with utility sheds is the extended 8′ side walls. For only $100, we can extend the side wall height of a utility shed up to 8′. The side walls on the lofted barn can not be raised above their standard 6′ 3″ height due to federal DOT regulations. This feature alone causes many buyers to select the utility shed over a lofted (or side lofted) barn. If having more headroom matters to you, the utility shed with 8′ side walls might be the best storage option. Our buildings come in 3 basic finish options: pressure treated, painted, or polyurethane. Of the three options offered, the painted and polyurethane finishes are the most popular with painted being the most popular. Inside our office at Spring Hill Sheds, we have a design center that customers can see actual samples of the siding and roofing options. There are several other optional items to customize your storage building even further including: windows, workbenches, shelving, house style doors, and much more. If you are looking to buy a storage shed, utility shed or any other kind of storage building, maybe one of the top selling sheds of 2017 could be what your backyard needs. 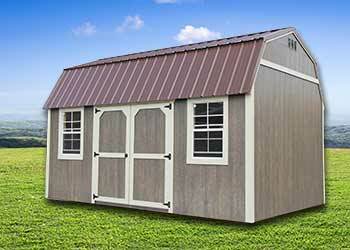 All of our storage sheds are built right here in Tennessee with famous Mennonite craftsmanship. In addition to storage buildings, we also have a large selection of metal carports metal buildings we offer through MaxSteel Buildings based out of Murfreesboro, TN. If you need some storage for your home or if there is any way that we can be of service, please don’t hesitate to give us a call at 931-486-2013. We are conveniently located next to Sonic in Spring Hill, TN.